The improved accuracy is also significant. In standalone operation, the drone flies within 10-15 ft accuracy. With the RTK base and SATEL Compact-Proof in place, that accuracy ranges from .9 to 1.5 cm, a drastic improvement that is especially valuable across construction and earthwork movement applications. As Eric Wischropp of Laser Specialists explains, this accuracy is appreciated even in the operational task of landing the drone. 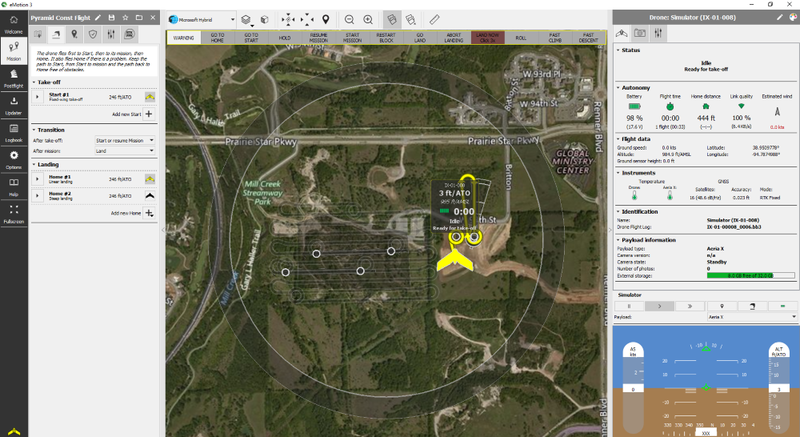 With RTK accuracy, the drone can easily be brought down in most locations on the jobsite. Without this accuracy, the operator has a more difficult and tedious task, needing to strategically identify a larger area for safe landing. 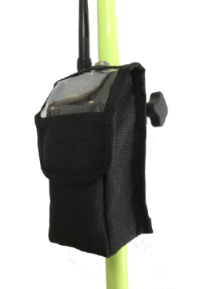 The SATEL Compact-Proof can also be used as an external radio at the base, if the GPS unit is without a built in radio. 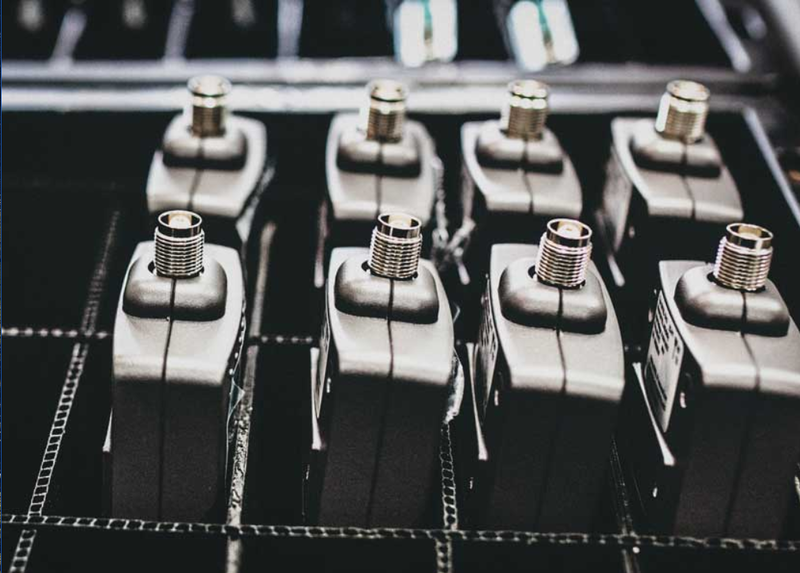 At 1W output power, the Compact-Proof can easily cover the range needed for most drone flights. The UHF signal also outperforms 900 MHz ISM and makes for much more reliable connectivity. In other cases, such as a long-range roadway project, Laser Specialists has also integrated the SATELLINE-EASy Pro 35W, either at the base or as a repeater, to allow for a larger working range. This solution also provides the possibility of integrated machine positioning and robust onsite capabilities. Note: On other Satel-compatible radios, or via 3rd party interfaces (such as Leica or Carlson Software), these terms may have different names. Other settings, such as Error Checking are uncommonly used. Start with the base/transmitting radio. The “TD” light should be blinking. If it isn’t, that means the transmitting radio is not receiving data via its serial port. Check the settings on the attached device to ensure it is correctly sending data via the serial link. Start by checking received signal strength. In the upper right corner, the number shown with a negative sign is the RSSI. A normal RSSI should be between -40 and -100 or so, with a higher number closer to the transmitting radio, and a lower number farther away. During normal operation the RSSI will likely change between a higher number, such as -60 and a low number (typically -120 or below). If the number stays low (below -100), the radio is not receiving a signal over the air, which indicates the frequency on the base radio and remote radio is not matching, or the base radio is not transmitting. Check and program the frequency on both radios. If the signal strength is high (above -100), or changing between a high and low signal, the next step is to check the RD light, which should be blinking. If it isn’t, this indicates a settings mismatch (the radio hears a signal, but can’t decode it). Check and program the 3 other settings (Channel Spacing, Radio Compatibility, Error Correction/FEC). If the RD light is blinking, but your data still isn’t making it through, check the Baud Rate on the receiving radio (in the “Port 1” menu), and ensure it matches the settings on the device attached to the receiving radio. The above steps cover the most common issues seen when setting up a Satel radio system. If the instructions don’t address your situation, or you are unsure how to match settings on a Satel-compatible device, such as a radio from another manufacturer, or via 3rd party configuration software, please contact us. 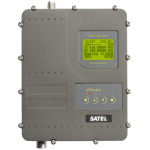 The SATEL Compact-4BT is an IP67 classified, 1W UHF radio modem with integrated lithium-ion battery and Bluetooth. It is designed for easy mobile use in demanding field conditions, ideal for land surveying, PrecisionAg and machine control application. SATEL USA brings further distance and less downtime to the construction site with our Machine Control solutions featuring the SATELLINE-EASy. Check out our infographic for a quick look at how 450 MHz can save time and money on the job site. Myth: Double power will double the distance of my transmitter. It is a common misconception that in order to achieve twice the distance in a radio link, you can simply double the power. The reality is that in order to double the distance, 4 times the Tx power is needed. This rule comes from a simple geometric formula: the propagation of radio waves expands in the shape of a sphere, and the surface of a sphere (and thus power density) changes proportionally to the square of the radius (in this case the radius = distance). To put it simply, if with a 1 Watt transmitter you can reach 1 mile, in order to reach 2 miles you will need a 4 Watt transmitter. Of course the distance depends not only on the power of a transmitter but also–and very much so–on the antenna gain and height, the quality of the receiver and on the obstacles in the terrain. A very useful way to calculate radio links parameters is using dB’s. In this case, mathematics show that doubling the power is the equivalent to increasing the power by 3 dB. It can also be demonstrated that doubling the distance is the equivalent of an increase by 6dB. Seen below is a table of equivalence between Watts and dBm. If in your licensing you have more than one frequency available for use, we recommend using separate TX/RX frequencies. For example, let’s say you have 469 MHz and 462 MHz available. You would set up the base to transmit at 469 MHz. You would set up the repeater to receive at 469 MHz (Main Menu>Radio Frequency>RX Frequency (change setting)) and to transmit at 462 MHz (Main Menu>Radio Frequency>TX Frequency (change setting)). Then you will set the rover to receive at 462 Mhz. This will ensure that even if the rover hears the base at times, it will not receive and interfere with the communication. As above, this also ensures that the base will not interfere with the rover, even if a double signal can be heard at different points. Another common issue in repeater set ups relates to modulation settings. Using a slower protocol, such as GMSK, is not recommended on a repeater set up because of the length of the data stream. The data string nowadays are so long that it can create a back up of data; the repeater may still be transmitting to the rover as the base is trying to send the next string. This can be resolved by using a faster protocol. Set up should also be considered; we have seen numerous situations in which the repeater is placed too close to the base, instead of near the rover. You want to make sure the repeater and rover are as close as possible in order to ensure the best signal. Double repeater set ups are much more complicated, especially when the rover is moving. Addressing, as described above, is recommended in this scenario. Even if the summer heat has passed, the heat dissipated by a 35 Watt radio can be an issue any time of year. It is perfectly normal for a 35W transmitter to generate enough heat to be very uncomfortable to the touch. Any transmitter of any major brand consumes energy equal to about three times the radiated power. In the case of a 35W transmitter, that is about 105 Watts. As a comparison, a 100 Watt light bulb cannot be touched when it is on because it is too hot to be handled. Something similar happens to a radio, although there are various steps you can take to decrease this large amount of heat. The first precaution the manufacturer takes is that a radio of 35W power is equipped with a heat-sink. Note that the heat-sink, normally mounted on the back of the unit, is only effective if air circulates freely without obstructions, and circulates vertically. A radio mounted horizontally will heat up much more than one whose flow of air can freely flow from bottom to top. A potential source of overheating can be in RTK equipment working with multiple constellations, thus requiring longer strings of data to be transmitted each second. This means that the transmitter will stay on for a longer period of time, generating more heat. The solution is a higher over-the-air speed, which will in turn reduce the transmission time. For example, a base radio sending RTK corrections to a rover utilizing a GMSK protocol will generate almost twice as much heat as a base radio using a faster protocol like 4FSK (at the same bandwidth). The difference can be dramatic. Another undesirable source of heat is the so-called “reflected power”. All the RF power of the radio should reach the antenna and should be radiated in the form of electromagnetic energy. If some of it returns back to the radio, the radio will heat up considerably more, not to mention that the working range will be reduced. In order to prevent reflected power, it’s very important to use a good RF cable with no damage and to make sure that the antenna is in good working condition without connector oxidation or other visible damage. Also, many users who utilize a steel whip antenna may not be aware that this type of antenna requires “tuning” to the right operating frequency. Normally such antennas are sold at a length which is optimal for the lowest frequency of its range. When a higher frequency is used, the operator should then cut it to the right length, as listed in the antenna instructions. Many users disregard this “fine tuning”, thus somewhat reducing their working range and increasing the heat (however only marginally). Even if all the above is taken care of, when a radio is left operating in full sunshine on a hot day, it will inevitably heat up. SATEL radios have an internal protection that prevents damage once the radio reaches 176°F (80°C). The radio will continue to operate at reduced power, and the screen will flash to alert the operator. Your best course of action if you believe heat has become a problem, especially in the summer or in warmer regions: reduce the power of the transmitter from 35W to 25W. It may be counter-intuitive, but this reduction of power (about 30%) will not affect the range very much. In fact, the range will decrease by about 15%, with the potential of saving you from a lot of downtime. Under Password enter your password of choice. NOTE: make sure your password is memorable or kept in a safe place, as there is no way to retrieve your password once it is entered (if you forget or lose the password, a new password will need to be set for all radios in your system). Repeat for all other radios in the system. NOTE: As a safe check across radios, the key hash will match on all radios with matching password. The key hash is NOT the password, but instead is an indicator: if the key hash is different on one radio in your system, the password was entered incorrectly and should be redone. Note that the LCD does not include any information or indication of the encryption or settings. Encryption support can be verified from the Firmware version. In Configuration Manager, when you go to Radio Modem Info, under Firmware Version it will list the version number, followed by “ENCRYPTION” or “CRYPT” or “CRYPT SURV”. Will a new radio with encryption work with my current radios without encryption? Radios with the AES-128 encryption feature are fully compatible with equivalent SATEL radio modem products when the encryption is set to OFF (Note: the factory default for the encryption feature is always OFF). Does encryption work in Survey Mode? CRYPT SURV firmware is available on our website (go to Support>Firmware). You can update/downgrade the firmware version between CRYPT and CRYPT SURV versions without issue. Can my current equipment be upgraded? You cannot update your standard firmware SATELLINE radio modems to the AES-supporting firmware in the field. Your equipment can be upgraded by the Satel factory. Please contact us for lead times and pricing. Please contact us at support@satelusa.com or 408-973-1740.